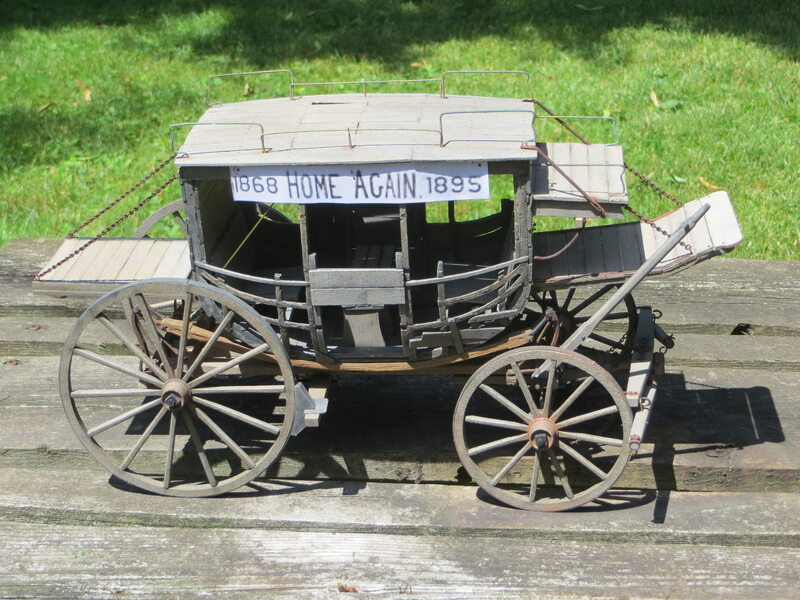 This is a 1/12 scale stagecoach that was returned by Buffalo Bill to the factory where it was built. I completed this build about a year ago pics to follow Cheers! John. Last edited by JohnReid; 11-30-17 at 11:07 AM. Like I do with a lot of my builds today I start with a kit, in this case, it was the Model Expo version.I use it mainly for the drawings and it is 90% scratch.I did something a little different this time.It took more time but was lots of fun.What I did was build each part and weather it as would happen in nature.I built it mostly from only four pictures that I found on the net that the Buffalo Bill Museum didn't even know about.Unfortunately, when the Smithsonian decided to restore it they reconstructed it using only the original undercarriage and the rest is new.Now it is just another stagecoach.Imagine how interesting it would be if they left it as it was?This is my attempt to do just that in miniature. This stage has huge historical significance for both the United States and Canada.The Cody family was from Ontario and Buffalo Bill performed many of his Wild West shows here to huge crowds.It traveled twice around Cape Horn on it's way to Europe.It was also originally on the Deadwood run, it fought in the Indian wars and was discovered by Bill abandoned in a river out west.He had the original manufacturer re-build it for his shows wich the sign on the side represents.It was then unfortunately donated to the Smithsonian. I have forgotten how to edit my pic size (I'm 77) Sorry bout that . Last edited by JohnReid; 07-29-18 at 09:59 AM. Thanks John cool thing there, could do some indian arrowe in the back or side, perhaps some luggage on the roof. Thanks, Egon. What I am doing here is to represent the stage as it was when it was returned to the factory at Concord New Hampshire.